The U.S. Census Bureau estimates that the number of Americans age 55-plus will exceed 75 million by 2010. Engaging seniors and earning their trust are essential to your success as their service provider, product seller or employer. There are many ways you can reach out to them through imprinted gifts and incentives that build relationships. Employee Gifts. During the last 20 years, the percentage of both men and women over 60 who are remaining in the workforce has been increasing – so be certain to consider your older employees when planning human resource campaigns. For example, day planners and desk calendars with large print are a good option. Pocket magnifiers keep the bottom line as well as fine print in focus. 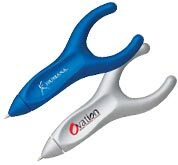 And the PenAgain™, an ergonomically designed instrument, is known to alleviate stresses normally observed with a standard pen and may help symptoms of arthritis. Internet promotion. According to the Pew Internet Study, there are 4 million seniors actively and “heavily” going online. Consider reaching this audience with a promotion that makes online time more productive and easier. Mouse pads imprinted with large print can list web site information. Or, appeal to a grandparent’s pride by gifting a promotional mouse pad with a photo slot for pictures of smiling grandkids. Helpful tools. Seniors appreciate items that make getting older a little easier. Grocery stores and pharmacies can distribute promotional bag-handles that hold several shopping bags at once while more evenly distributing the weight and cushioning the grip. The classic rubber jar opener is also valued, as are pill cutters and lightweight promotional reading glasses. There are thousands of options for you from a growing collection of senior-specific promotional products. Give us a call at 708-478-8222, send us an e-mail or visit us online at www.linjen.com to begin turning this gray demographic into gold for your business!